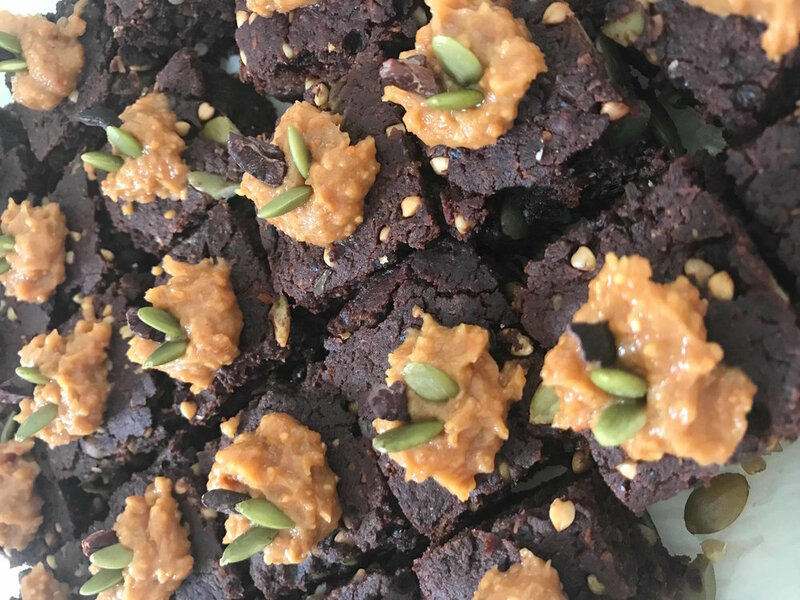 Sweet Potato, Black Bean, Cacao Brownies with a Delicious Peanut Butter topping! If you're like me and have a sweet tooth taking high reign in your routinely palette cleansers... it's essential to build an understanding of knowing how to naturally swap to all wholesome natural sweeteners and sugars instead of the highly addictive processed stuff! People are often shocked at what can be created with whole-food ingredients, this recipe is defiantly one for the books! Even if your face is a little skewed at the concept of having black beans or sweet potatoes as the key elements! You're not only getting a sweet hit to your day, but lots of good natural fibres and added protein! Since swapping out my sugars many years ago, dealing with acid reflux for years, changing to a plant based, whole-foods diet has made life that little bit easier. Being kinder and more aware of what does and doesn't work for my body, in my case highly processed foods were/are a big No No, leaving me with highly painful and unpleasant acid reflux primarily caused from processed sugars and acids from preservatives! Being able to still treat myself, create delicious whole-foods treats and make the commitment to my body, really takes the stress away as well as the mindset of "Not having enough" to "Utilising what I can have"
Get creative with your ingredients, utilise what you have on hand, there's not right or wrong way of cooking, the best way to explore is to test it out yourself! To make the peanut butter topping combine all ingredients into a mixing bowl, use your muscles to mix together well until nice and smooth! Cut the brownies into desired shapes, top with peanut butter topping and some cacao nibs for crunch! Once cooled, keep in an airtight container in the fridge!